I've never participated in a linky party before. When I saw this one I had to do it. Individually, I have 8 tattoos. My dear friend and I are planning getting a Wicked tattoo before I leave. So here are some of my tattoos. 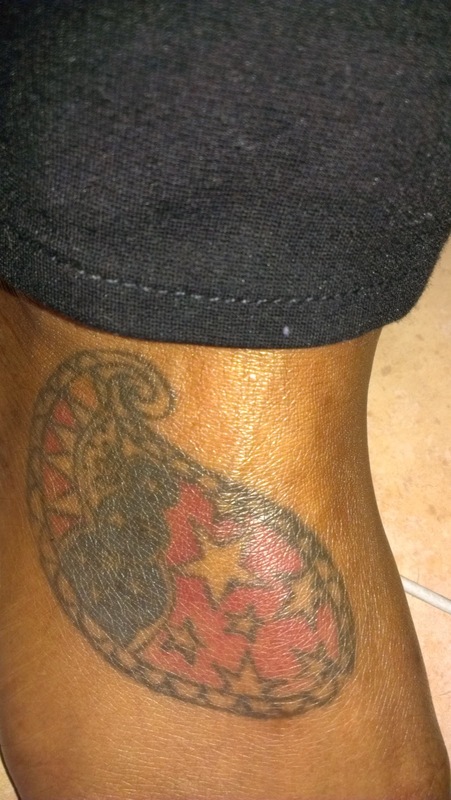 This is a paisley on my foot. I lovingly refer to it as "The Amoeba". I got it because I wanted something with color. I don't really have a long story behind this one other than it was fun...The color is fading, I'm not sure I'll touch it up. 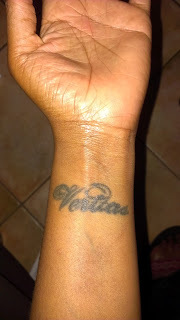 This one says Veritas. It means truth in latin. This one means a lot to me. My mother named me Vera because it means truth. I try to lead a very truthful life. I didn't get it to get my own name tattooed on myself...more so to remind me to be truthful...always. This is my bird. I am horrifically, deathly, sobbing on the floor, afraid of birds. They scare me. Sooo having a bird tattoo doesn't make a lot sense. 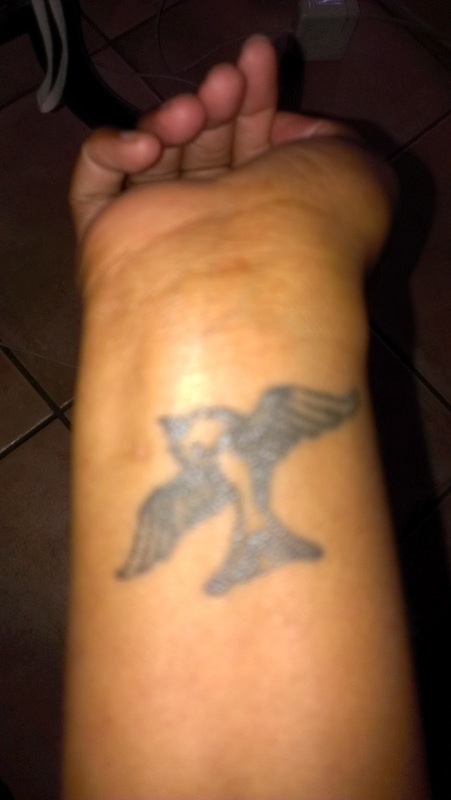 I got this after a family member died..I wasn't particularly close to them...but they were one of the last members in our family line. It's kind of like the closing of a chapter. There are 2 rules to follow in this Inky Linky party. 1. Please use good judgement when posting pictures of your tattoo. If it's in a place where we have no business looking at it, then please don't. If it contains profanity or other vulgarities, please do not post it. 2. Please DO share your pic and story as to why you got it and what it symbolizes. That was fun! Share your tattoo stories too! Also, there are two questions left to answer from the last post. The correct answer gets you my Eat your Veggies unit. And now dear reader, I'm off to Lakeshore. I've got an addiction.